One could argue that the only place where the revolutions of the Arab Spring have actually made a change for the better is Tunisia. The North African country has had its own issues since 2011 -- we've all seen terrorist attacks on tourists featured in the news lately -- but perhaps Tunisia's downturn has much to do with its close proximity to terror hotbed Libya. The Tunisian people on the other hand have managed to show the world the meaning of resilience. And courage. It is often those who start something that suffer the most, because as pioneers they are at the forefront of a movement that will change lives, just perhaps not their own, in their lifetimes... In her film As I Open My Eyes (A peine j'ouvre les jeux) Tunisian filmmaker Leyla Bouzid shows her country on the eve of the Jasmine Revolution, through the eyes of a daughter of the nation, Farah, as well as her parents, friends and bandmates. But a film to me is only worth the enjoyment it brings. True, I like a little learning with my entertainment, but if you teach and preach to me, even if you wrap it in pretty movie bows, I won't feel like I'm walking out a better person. And this is where Bouzid's brilliance truly shines through. Forget the fact that the audience in Venice -- where the film premiered in the Venice Days sidebar -- voted to name it their favorite out of all the great films in that line-up; forget the fantastic performances by Baya Medhaffer as Farah, a wannabe rockstar and teenage "revolutionista" and renowned singer Ghalia Benali as her strong, caring, beautiful mother Hayet; forget the fact that the SANAD fund from Abu Dhabi helped finance the film, and they are my hands-down favorite cinematic organization to encourage films in the Middle East and the project was presented at the Dubai Film Connection, part of the market at the Dubai International Film Festival, my favorite event in the world; forget even the haunting songs and poetic lyrics by Khyam Allami that make up the soundtrack; because beyond all these already fantastic credentials lies a great film. A film with heart and passion, one that can color one's dreams and inspire one's days. I caught up with the gracious, intelligent and soft-voiced Leyla Bouzid in the garden of the Villa degli Autori, in Venice. Her film screens next at the Toronto International Film Festival. Did a particular event in the news inspire your film or was it born out of a personal experience? Leyla Bouzid: Actually the inspiration for me to make this film was the revolution. I really wanted to "re-talk" about it, about both the revolution and that period [right before it]. I wanted to capture the atmosphere and also to capture the situation with the police. I had a desire to show the relationship between the mother and the daughter and that the daughter was very explosive; free of mind, free spirited and she wanted to make her mother more evolved. Modernize her. The idea that the mother would learn from her daughter. How much of you is in the character of Farah, and maybe in the character of the mother? Leyla Bouzid: I think there are some things of me in the character of Farah, but I wasn't like her because Farah has no limits while I was very conscious of the limits. In that, Farah is the opposite of me. I think actually she's much stronger than me, but there are also events in the film that I have lived through myself. So in that it's a little bit biographical. I have had the experience of a really, really close friend whom I trusted completely and was shocked to find out later he was a police agent, actually spying on me. Also, I wanted to highlight the family situation, how the relationship is between Farah and her family. While you were making the film, did you imagine reaching out to Arab moviegoers or bridging across to international audiences? 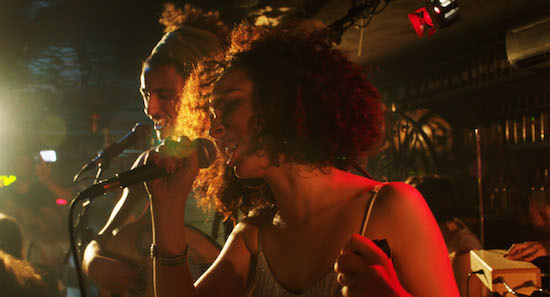 Leyla Bouzid: For me the ideal audiences are the youth, and in particular the Arab youth. Not only from Tunisia but from other Arab countries. I hope they can capture and understand this liberty, that they are now free and they can be free in their spirit. I want them to know that they don't have to be manipulated, just be themselves. And what do you want people to walk away from your film having learned? Leyla Bouzid: I want to tell the Arab youth that there is a way of expressing themselves and that they should be able to inhale a "whiff of freedom," and for my international audiences I'd like to show them that we have strong women, artists, people who resist in Tunisia. That there are different kinds of terror but hope that through watching my film we demonstrate there is also a kind of hope, a breath of life. What is the first film you remember watching as a child, and what are your cinematic inspirations? Leyla Bouzid: At fourteen I watched Citizen Kane, but I love Ingmar Bergman a lot, especially Cries and Whispers and Persona; I also love Akira Kurosawa's Seven Samurai, Fatih Akin's work and in particular his first films like Head On, for their structure and melancholy, Asghar Farhadi from Iran, and an Israeli film titled Or (My Treasure). I love that a Tunisian filmmaker, at a festival in Italy can name an Israeli film as one her favorites. This brings me to my favorite question... Do you think cinema can be a bridge across cultures? 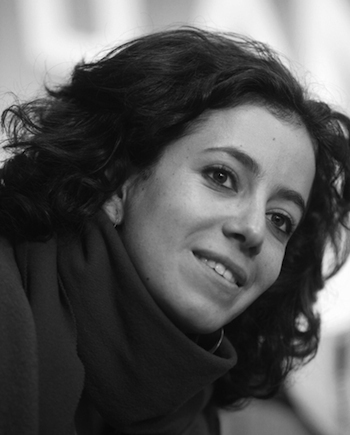 Leyla Bouzid: I think cinema allows for a deeper understanding of events, more than the media and news. Cinema goes further. For instance, in the case of my film, people will understand much more about the revolution, not just the aspects of it but from the inside out. The intimacy of the situation. Through cinema you can communicate the human aspects in a more profound way than in any other way of communicating. Cinema is for me a way to understand the human aspect, all the way through to the political aspect, with all the feelings in between. Leyla Bouzid: Films can offer a bridge to feel something we don't know, not only to discover but to feel, that's what I really like in cinema -- feelings. Leyla Bouzid: Can I answer tomorrow (laughs)?! Willpower, because thanks to it I can make cinema, feelings and woman. Images courtesy of Venice Days, Giornate degli autori, used with permission.